Sleek and modern in design and spinning with a ton of color and excitement, you will love our new S-Curve Double Wind Spinner Stake! 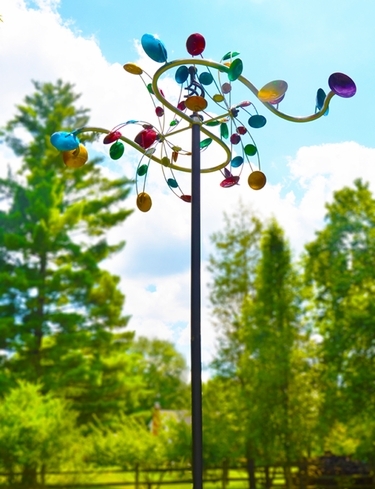 A multi-dimensional colorful whirlwind of art in motion, this beautiful metal wind spinner will look amazing in any home garden landscape! As the full unit spins around horizontally, two independent vertical wheels on the fancy S-Curve design add dimension and intrigue. If you need an impressively tall garden stake with color and motion galore, this garden accent is simply amazing. Optional Flat Surface Stake Display Base (RC-39001) sold separately. S-Curve Double Wind Spinner Stake. Size: 28"L x 21" W x 72"Tall, all Metal. Plenty of surface area for great wind capture. Thick poles & H-Stake ground fork.